The district of El Raval has two different faces. North El Raval is a zone with numerous cultural buildings, whereas south El Raval being formerly the infamous Barrio Chino (Chinese District), is mainly residential and a rather poor district. It still contains some old factories, a reminder of its industrial function during the Industrial Revolution. These differences in character of the two parts of the Raval were incorporated in the city's urban renewal plans. All the new cultural investments were located in the northern part of the district: The Museum of Contemporary Art, (MACBA), the Contemporary Culture Centre (CCCB), several new buildings for a private university and the Ciutat Vella history archives, among others. In the last few years, this northern zone became increasingly gentrified, while the southern district remained, until recently, degraded and dangerous. 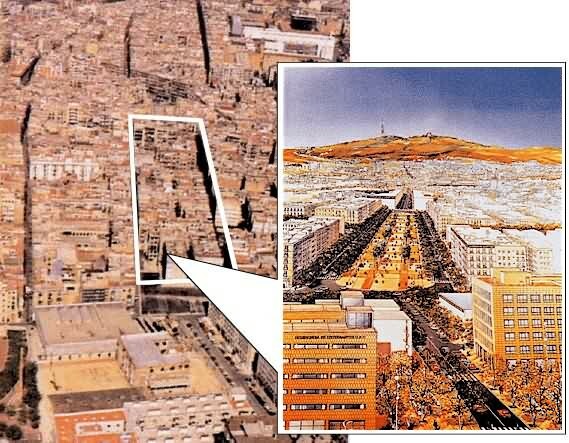 In 1995, the plan for the 'Boulevard of the Raval' (or Raval Rambla) was presented, with the aim of socially cleansing southern El Raval. Five complete street blocks were affected and the scheme involved the demolition of 1,384 houses and 293 commercial premises. The tree-lined pedestrianised zone thus created measures 58 metres in width and 317 metres in length. The central zone, without urban furniture some, is planned for street markets and other social events. The new boulevard improves the flow of traffic in the area, reducing congestion in the surrounding narrow medieval streets. New housing blocks have been constructed at both ends of the Rambla, and existing buildings are being renovated for use as student accommodation. Environmental improvements include a pneumatic refuse collection system. The development cost more than 5 million euros and was 80% subsidized by the EU Social Cohesion Fund. A further project focuses on the Robador, Cadena, Oriol, Sant Josep and Sant Rafael streets adjoining the Raval Rambla. This involves the construction of a four star hotel of ten storeys, combined with houses and offices. The ground floor includes a cinema and an adjoining snail-shaped building will contain apartments. The project includes private gardens. Hotel clients will be able to gain safe access to the Raval Rambla via an overhead walkway without making contact with local residents. There is currently considerable property speculation in the zone, with an increase in prices and the consequent displacement of less well off neighbours. A new 4 star hotel, houses and parking area are planned for one of El Raval's poorest quarters - the area delimited by the streets of San Rafael, Rambla del Raval, Sant Josep Oriol and Robador. The plan proposes 11,300 m� of new housing, 9,400 m� of offices, 9,300 m� of hotel and commercial space plus 556 parking places. Between 100 and 140 new houses will be constructed, 25% of which will be for protected tenancies for existing local residents. One of the main stumbling blocks for the project is the height of the ten-storey hotel building - some 37 metres. The objective of the government of Barcelona is to turn the building into one of the most representative (or characteristic) architectural pieces of the district of the Raval like the church of Sant Agust� or the Opera House. Barcel� Raval Hotel: has the Raval exceeded its tourism carrying capacity? The 'new look' El Raval: an urban rebranding success?